Years ago, Origo used to be the leading news site in Hungary. In February 2016, Origo was acquired by investors with ties to the government, and since then, the once high-quality news portal has increasingly turned into a pro-government propaganda outlet. As a result, Origo now publishes articles spreading hatred against migrants in many ways and many forms. On 13 March 2018, the front page of Origo used the word 'migrant' 12 times, always in negative contexts, such as violence, terrorism, war, and threat. In the run up to Hungary's general election on 8 April 2018, the ruling party Fidesz has built their campaign on a tough anti-immigration agenda. The government introduced its anti-immigrant policy back in 2015, when a barbed wire fence was installed on its southern border, as a response to an increase of refugees moving up from the Balkans towards northern Europe. An anti-immigrant campaign, the ‘National Consultation on Immigration’, was also launched. This campaign consisted of questionnaires to citizens, asking on whether they agreed that immigrants are a threat to security and incomes, and anti-immigrant posters warning immigrants not to take Hungarians’ jobs. Later, the government rhetoric started to target the billionaire investor and philanthropist George Soros, accusing him of wanting to bring millions of migrants to Europe. On 2017 alone, the Hungarian government spent 23 million euros on its Anti-Soros and anti-EU propaganda campaign. The government anti-immigrant rhetoric appears in all media outlets of the country which are linked to the government, including Origo. Years ago, Origo used to be the leading news site in Hungary. In February 2016, Origo was acquired by investors with ties to the government, and since then, the once high-quality news portal has increasingly turned into a pro-government propaganda outlet. As a result, Origo now publishes articles spreading hatred against migrants in many ways and many forms. 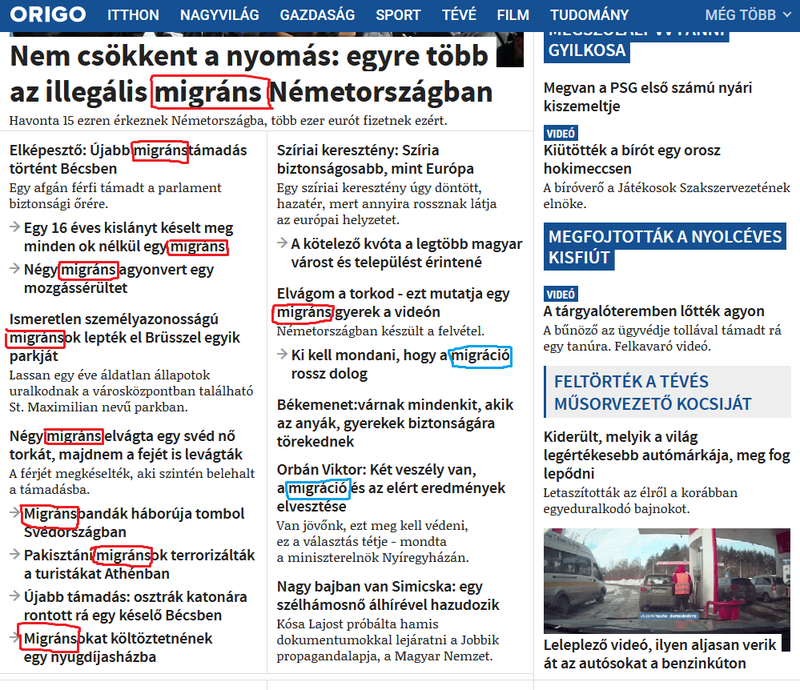 On 13 March 2018, the front page of Origo used the word 'migrant' 12 times, always in negative contexts, such as violence, terrorism, war, and threat.